One major cause of less than adequate nutrition in India is ignorance of facts about foods and nutrition. Poor economic conditions do stand in the way of improved nutrition but ignorance regarding nutrients needed by the body and cheap foods that provide them, is partly respoisible. 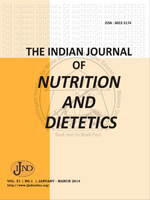 Knowledge about nutrition is not imparted systematically in either schools or colleges barring Home Science Colleges, where it is taught along with a varied number of allied subjects, like physiology, chemistry and bio - chemistry.